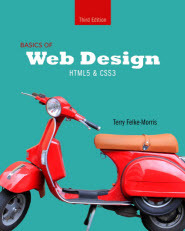 The 5th edition of the popular Basics of Web Design: HTML5 & CSS textbook builds on the successful earlier editions of this textbook. The 5th edition includes a major update with a focus on new CSS layout systems! Chapter 8 has been renamed Responsive Layout Basics! This chapter introduces the new CSS Flexbox Layout and CSS Grid Layout Systems. 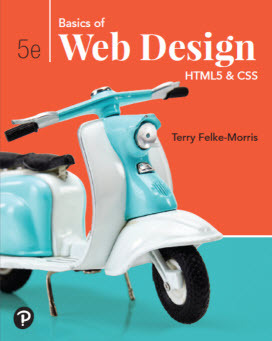 The 5th edition continues to integrate HTML and CSS topics such as text configuration, color configuration, and page layout with an enhanced focus on the topics of design, accessibility, and Web standards. The 5th edition is available at Amazon.com, Barnes & Noble, and other popular booksellers! The 4th Edition was placed in a textbook rental program offered by Pearson. As a service to students, the 4th Edition Student Files resource is available as a free download. Get your free download of the 4th Edition Student Files! 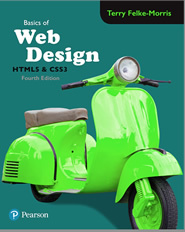 Comprehensive instructor materials are available for the Basics of Web Design HTML5 & CSS3 book. The third edition was published in January 2015 and builds on the textbook's successful first and second editions. Review activities are available for each chapter on this website. Some instructors use these as group activities in the classroom. They also can be made available for independent student self-assessment activities. Students can use these activities to check their knowledge of concepts and terms. Dr. Terry Ann Morris has a unique background that combines both practical and academic experience with years of working in industry as well as many years teaching technology courses.